Geeks everywhere are celebrating 50 years of boldly going where no man has gone before and this week CBS Consumer Products has announced a new way to commemorate Star Trek's 50th anniversary. 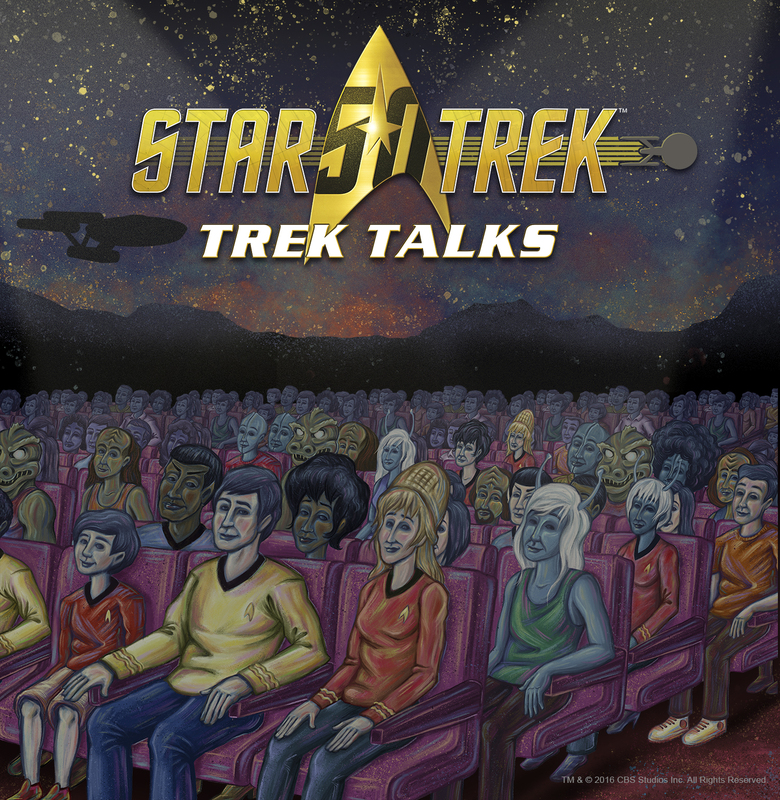 Dubbed Trek Talks, the new speaker series will be a world wide initiative designed to bring Trekkies together for a new and exciting live event program that will explore the impact and influence of Star Trek over its 50-year span. Trek Talks will be locally produced and hosted by academic and entertainment institutions including colleges and universities, science museums, and pop culture centers and festivals as well as other non-profits and commercial corporations. Each selected organizations (in partnership with CBS) can choose a topic from a group of themes that will cover a broad arrange of our Trekkie favorites that showcase the full scope of Star Trek’s influence or they can develop their own theme. Each participating organization will develop, promote and stage the event during Star Trek’s 50th Anniversary from July 2016 to July 2017. Current organizations participating in the project include NASA, Toronto International Film Festival, Intrepid Sea, Air & Space Museum, EMP Museum, and the Canadian Space Agency. Trek Talks is already slated to be staged at significant pop-culture and entertainment events including San Diego Comic-Con in July, the Star Trek Las Vegas convention in August, Star Trek: Mission New York in September, and Destination Star Trek Europe in October. Star Trek celebrates its 50th anniversary in 2016. Born from the mind of Gene Roddenberry, the original Star Trek series debuted on September 8, 1966 and aired for three seasons -- a short run that belied the influence it would have for generations. Launching the careers of William Shatner and Leonard Nimoy, the series also broke new ground in storytelling and cultural mores providing a progressive look at topics including race relations, global politics, the environment, and more. It spawned five more television series and 13 feature films spanning the course of half a century. Beyond its impact on the entertainment landscape, Star Trek has also inspired some of the greatest minds steering the direction of our modern world and sparking the biggest technological advancements of our time such as the cell phone, universal translator, smart watch, tablet, sonogram, and countless other inventions. Those who cite Star Trek as an influence on their lives include Stephen Hawking, Neil DeGrasse Tyson, Elon Musk, and countless others. To further commemorate Star Trek turning 50 CBS Consumer Products will be hosting a 50th Anniversary Convention to be held in Las Vegas this August 3-7th. Additionally they will be hosting a first ever Star Trek Cruise, hosted by William Shatner and featuring appearances by fan favorites from the franchise will also join the voyage, including Marina Sirtis, Jonathan Frakes, Robert Picardo, John de Lancie, James Darren, Denise Crosby, Steven Rankin, Vaughn Armstrong and Casey Biggs. CBS has also confirmed we will see a new Star Trek television series. The news series will launch in early 2017 with a special preview broadcast on the CBS Television Network. The premiere episode and all subsequent first-run episodes will then be available exclusively in the United States on CBS All Access, the Network’s digital subscription video on demand and live streaming service. The next chapter of the Star Trek franchise will also be distributed concurrently for television and multiple platforms around the world by CBS Studios International.